For fans of the genre, this is a noir cartoon come alive. An over the top, but fun to watch network of evil-doers surround John, an anti-hero it’s easy to root for. Much like Clint Eastwood’s William Munny in Unforgiven, we see a bad man who was rehabilitated by a good woman, and in her absence allows himself to be sucked back into his prior trappings. In John’s case those trappings include a colorful collection of killers and cleaners working within an intricate system that keeps the wheels of the underworld turning. These are the people that get called on when the job is too much for the average nameless henchmen. And together, they comprise the perfect excuse for first-time directors David Leitch and Chad Stahelski to amass some of the coolest, most underrated actors working today. All on one project. From Swearengen to Reek to O’Reily, Daniels and Lester Freamon; Pretty heavy HBO presence here. Kudos to casting directors Jessica Kelly and Suzanne Smith. As anyone who watched the trailer already knows, in typical Theon Greyjoy fashion, Alife Allen’s character decides it’d be a good idea to do something rather stupid. In this case, to steal John’s car and to kill his pup Daisy. Well, not since Travis Coates was forced to shoot Old Yeller have so many people mourned the death of a dog. But this time, rather than the audience crying, it was the film’s villains who oh so regretted that despicable act – cause with it, came a hurricane of rage by the name John Wick. In 1999 Mel Gibson starred in Payback. A remake of the 1967 Lee Marvin vehicle Point Blank. In this movie Gibson played Porter, a man driven by principle, uniquely focused and with unwavering purpose. John Wick is a character not dis-similar. The theft of his car and the murder of his dog symbolize the apparent end of the new life John had crafted, free of gun play and criminal ties. So now, like Porter he returns to claim what is his – not $70,000 in cash – but a justified revenge. A need to unleash the Hell that he was holding at bay with the means to exact a wrath of biblical proportions. The film’s performances are all heaped in thick genre tones (ie; Brittany Murphy’s brilliant turn in Sin City). Adrienne Palicki is great as Ms. Perkins, adding much more to the character than just eye candy. Often times women that look the way she does don’t get to do much more than look pretty, but she is given a real part to play here. Willem Dafoe, while a bit underused, plays a slightly against type here and it really works. The best of the supporting characters would have to go to Lance Reddick however, an even keeled, monotone delivery of his lines often offers a moment of levity, which in a film this dark of tone can be a nice respite. But ultimately it’s John’s familiarity with his adversaries, coupled with their respect for him that really rounds out many of the characters. The movie plays on a lot of familiar tropes (the Russian mobster perhaps being the biggest of them), but it’s fun, if not fairly predictable for action movie aficionados. From the wise mentor to the old friend, to the Femme Fatale, all the standards are here. Though perhaps that’s why the film has a vintage feel to it despite the more modern cinematography and soundtrack. It’s unapologetic for its violence, and it stays true to genre’s fans, delivering multiple standout fight scenes, which isn’t a shock given the directors’ background in stunt work. It’s not the most original or groundbreaking film ever made, but it’s one of the best action movies not ripped from the pages of Marvel Comics in a while. John Wick makes many of 2014’s other ‘shoot em ups’ pale in comparison. Movies like The November Man, Jack Ryan: Shadow Recruit, 3 Days to Kill, Non-Stop, they all feel rather forgettable when held in the same light. 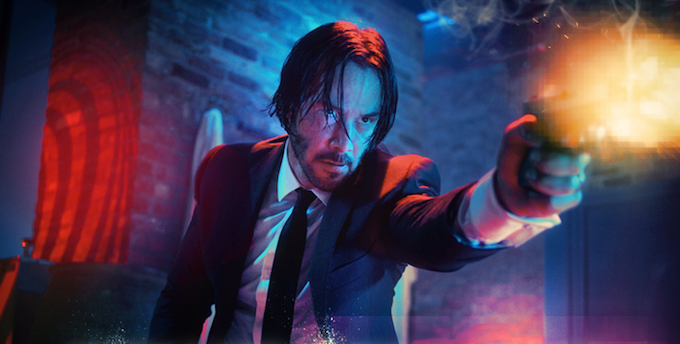 So, if you’re a fan of the genre, or just desperate for a solid action flick without superheroes, go see John Wick. And give your dog a treat.